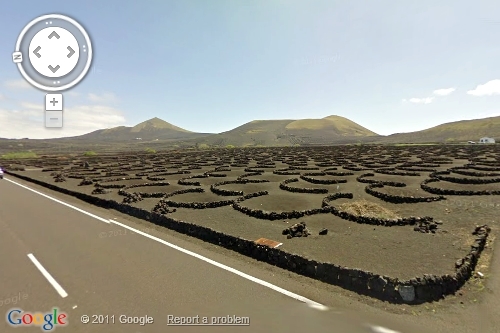 Lanzarote in Canary Islands is famous for the Malvasia wine grapes - one of tastiest and oldest known variety of grapes. 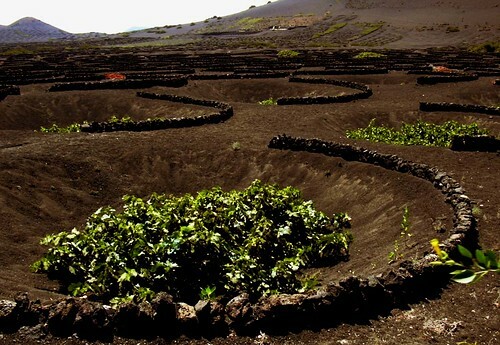 For centuries the local inhabitant of La Geria region in Lanzarote have been cultivating these World famed grapes in a unique sunken pits instead of the traditional method of grape farming where the grapevines are supported on trellis. The arid and hostile volcanic region receives about 14 cm of rain per year, which is much less than the rain received in some parts of Sahara. 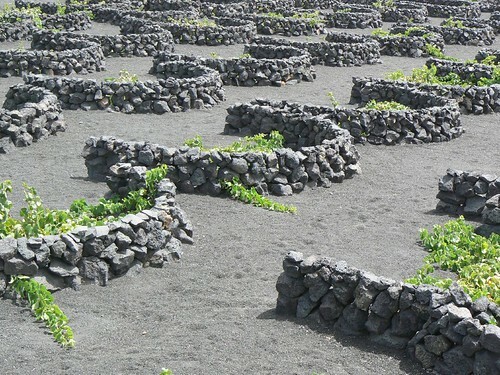 To overcome this deficiency the Lanzaroteños (inhabitant of Lanzarote) devised a unique method of cultivation by planting a single plant in a 4-5 metre wide and 2-3 metre deep pit. The hollow pit is filled with soil and topped with thick layer of small pieces of black lava rocks known locally as "picón". These lava rocks have the property of soaking moisture from air during the night time and provide the much needed water to the crops. 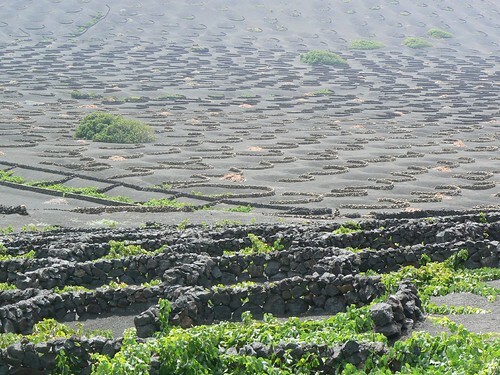 In order to protect the plants from strong winds, which are very common in Canary Islands, the locals build an almost semi-circular, about 2 feet (0.6 metres) high protective wall around the pits and allow the vine to spread laterally instead of trellis support. 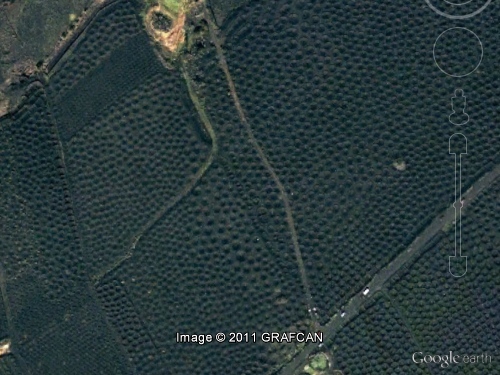 There are more than 10,000 such pits in La Geria region spread over 52 sq. km (20 sq. miles) and rows and rows of hollow pits and the surrounding semi-circular walls gives the region the look of an out-of-this-world landscape.